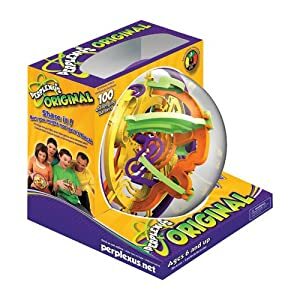 Toy Shopping: - Perplexus Maze Game by PlaSmart, Inc.
Perplexus is sphere in which you guide a small silver ball around an obstacle course. This is a toy all kids will absolutely like and dad will love too. It is very engaging for long periods at a time and as a refreshing bonus no batteries are required! Think of the money you will save. Even better is the fact that there are no annoying noises to cope with, just the thing when you just need the kids and dad to be quiet for once. If you are going out take it along with you to keep them busily occupied. In fact buy two then you have one for the house and one for the car - ready for those sudden outings where you may be away for longer than the kids usually can manage. This newer design includes more than one starting point, which is really great for when they have got a long way through the puzzle only to fall off part way through. Great training for patience and perseverence, and hey...wonders upon wonders - no electronic gizmo's in sight. spend $25 or more and you get free shipping. Join in and write your own page! It's easy to do. How? Simply click here to return to Toy Shopping.